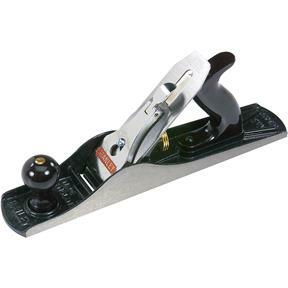 The plane features hardened, tempered-steel construction for precision-ground cutter edge durability that lasts long and true. Its fully machined and polished double-iron cutter and lever give you precise control over the piece at hand -- no matter how hard or uneven the material may be, and the solid brass cutter-adjustment knob is rugged and durable. The frog seat is machined for precise mouth adjustment, and the kidney-shaped hole in the lever cap helps secure the cutter in place so it won't budge, regardless of how rough you handle it. This professional-grade plane also boasts a quick-release cam lock that makes iron removal easy, plus high-impact polymer handles and knobs that are contoured and polished to give you a great grip that permits true accuracy and long use without fatigue. Top it all off with a durable epoxy coating, and you'll enjoy heavy-duty use from this plane for years to come. It took awhile to tune it up but itâ€™s a worker. After the tuneup I squared up a white oak quartersawn board and it did a nice job. I am new to using planes and have found this one an excellent one to learn my techniques on. I was able to dismantle this one, sharpen the blade and increase the edge bevel and reassemble in pretty quick order. Since then I primarily use this on my shooting board where it works very nicely. I found this to be an excellent value. I brought this plane two months ago to joints some boards for barn doors I am making for my den, My work shop is small and cannot accommodate a jointer which I would probably use only occasionally. Did not want to spend too much on a jack plane (might as well brought a jointer) and this plane fit the bill. After honing with a water stone and a little upper body workout, this plane did a great job, I can put it on the self and pull it out when needed. It is a great economical choice for us small space, low budget woodworker want -to-be. Once you know how to set it up, it is an excellent tool.